The track attack program is aimed at children ages 10 through 15. 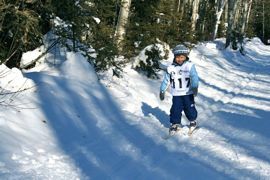 The program is designed for skiers in the learning to train stage of cross country ski development. 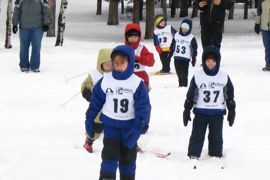 Youth are trained to become technically competent cross country skiers. 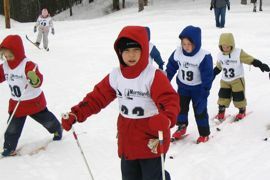 In learning these skills, skiers are encouraged to explore a wide range of cross country ski activities varying from backcountry ski trips to skiing tournaments. Also, youth actively participate in games and activities, become part of a team with other children in the same age group, develop their overall sports skills, and have fun! Track attach lessons are held at the Doug Barnes Cabin on Saturdays at 11am. The program starts in January and runs for 8 weeks. For insurance reasons, students must become a member of the Ptarmigan Nordic Ski Club. Youth membership fees are $15 for the year (or $40 for the entire family). Track attack program fees are an additional $15 per child. This cost covers CCA youth program registration fees, 8 lessons and any additional youth activities organized through the club. The PNSC has skis available for track attack students to use during their lessons. This includes skis, boots and poles. 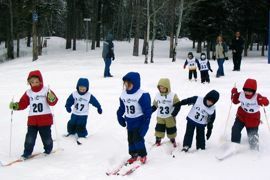 The club tries to have both classic and skate skis available for track attack students to encourage skill development in both ski techniques. Parents are expected to help with clothes and equipment, joining in classes and games, and arranging refreshments. 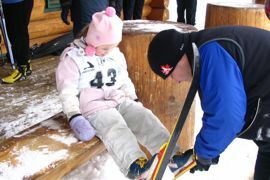 Parents are also encouraged to become certified instructors by taking the training courses arranged by the Ski Club.